The Nick Cave-penned Aussie Western that launched John Hillcoat's career is still a beautifully crafted film. It's a familiar Western tale from the Australian point of view about their sordid history and association with British Imperialism. 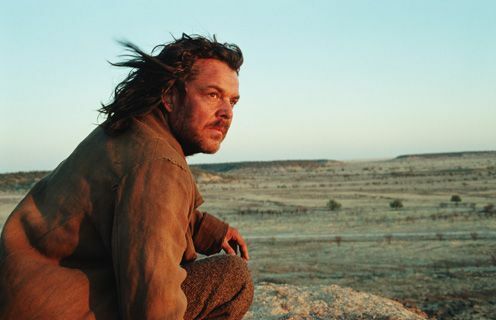 'The Proposition' is a story about a British officer who puts his job before his family in the idealistic hope of civilizing the lawless Australian outback. It's exemplary of the resonant mythological qualities of the classical Western. The opening reminds us of Days of Heaven, featuring still photographs of the era with a quiet melancholy soundtrack over the main credits. It sets the time, place and mood of the film perfectly. The inciting incident happens before the film starts. A well-respected family is brutally murdered by a particularly brutal gang led by the sadistic maniac Arthur Burns (Danny Huston). After a Peckinpah-worthy shootout, lawman Captain Stanley (Ray Winstone) captures Burns’ two brothers, Charlie (Guy Pearce) and Mikey (Richard Wilson). Stanley makes a proposition to Charlie – to find and kill his older brother Arthur within the nine days before Christmas, or he will kill his younger brother Mikey. Charlie accepts the proposition and sets out to find his long lost brother. Though Guy Pearce’s character is structured as the main protagonist, the complexities of the film lay with Captain Stanley. His dedication to the law and the land compromises his family as husband to his beautiful and refined wife, Martha (Emma Watson). But Stanley has convictions about his role in Australia. His commitment to his job is fed by his desire to provide a peaceful home for Martha - thus his need to “civilize” the land. We discover the ramifications of his ‘proposition’ when his superior, Eden Fletcher (David Wenham), arrives in town. When he finds Mikey Burns in custody, he orders a 40-lash flogging as punishment for the Hopkins massacre. With his word broken, Stanley knows Arthur and Charlie will soon go after him and Martha – therefore his proposition effectively becomes his own death sentence. Cave and Hillcoat effectively build up the Arthur Burns character to be a Kaiser Sose/Col Kurtz-type larger-than-life antagonist. We don’t meet him until the second act, but the stories told about him portray him as a spirit or a legend. The aborigines describe him as part man, part dog with long ears and a tail. When we finally meet him, he doesn’t disappoint. He’s aloof but sadistic. He speaks with calm eloquence, but his actions are maniacal and vicious. Likely inspired by Brando’s Col. Kurtz in Apocalypse Now, Danny Huston plays him to perfection. Nick Cave’s ethereal buzzing music soundscapes add to the Australian feel of the film. There’s a strong sense of aborigine spirituality throughout the movie, which reminds us of Aussie classics Walkabout, Picnic at Hanging Rock and later The Assassination of Jesse James by the Coward Robert Ford. The film builds and builds to a violent cathartic ending. Charlie and Arthur ride off to rescue brother Mikey and avenge his beating, while Captain Stanley and his wife try to have a peaceful Christmas - a soon-to-be tragically ironic occasion. Have some patience with the film and pay attention to the quiet dialogue, which is sometimes difficult to understand. It’s all fuel for this violent but beautiful layered genre gem. Enjoy. The Proposition is available on Blu-ray from Alliance Films in Canada.